Easter is my favorite holiday of the whole year. There are so many reasons that I love it: the fact that spring (my favorite season) is finally here, the gorgeous bright colors, the decorations, BUNNIES (my favorite animal), Cadbury Eggs, new Easter dresses.... the list goes on. But all of the falls far short when thinking about the reason for Easter: Jesus's resurrection. Without Jesus, there would be no Easter, and there would also be no Christian faith! Just think about that for a second. I would encourage all of you to read this short Easter devotional, which can be found here. It is very powerful, and definitely gave me a lot to think about and be thankful for! 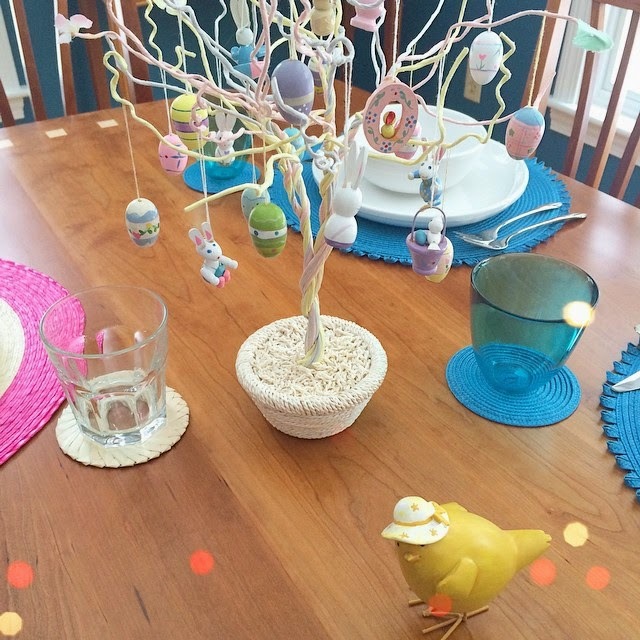 Easter table decorations that were waiting for me at home! Happy Easter! It is one of my favorite holidays as well! Happy Easter! I am just starting to figure out where I am with my faith. I am so happy you posted this and the Easter devotional. I can't wait to read it. I hope you have a wonderful day! Thank you so much for sharing, A! And I agree, it's amazing what God will lay on your heart to write about when you have a blog :) Hope that you made it home safely!